Time for the monthly Thunder progress report! Record: 9-8-1-1, 20 points. 4th place in North Division, 8th in Eastern Conference, 15th overall. Penalty Minutes: 243 in 19 games, avg 12.79/game, 21st. Power Play: 22.0%, 4th. Penalty Kill: 78.8%, 24th. Goals For/Game: 3.42, 8th. Goals Against/Game: 3.58, 22nd. Shots For/Game: 33.47, 10th. Shots Against/Game: 31.63, 13th. -With Daniel Walcott getting injured in Wednesday’s Crunch win in Toronto, Mathieu Brodeur is going back to Syracuse on a PTO. This will be Brodeur’s second PTO of the season, after appearing in 7 games with Springfield to start the year. Since returning to the Thunder, he has appeared in 12 games, going scoreless with a +1 rating. -Taking Brodeur’s place on the roster will be rookie defensemen Matthew Spencer, who will be starting his second Thunder stint. He had appeared in three games during the road trip in early November, going scoreless. Since returning to the Crunch, he has only appeared in two games, not seeing action since November 24th vs. Wilkes-Barre. -And one more to add to the blue line: second year pro Vytal Cote has signed a standard contract. The 22 year old Florida native started the season with the SPHL’s Mississippi Riverkings, appearing in 10 games with 3 goals and 3 assists. He began his pro career last season with Fayetteville and Evansville of the SPHL, playing in a combined 50 games with 2 goals and 9 assists. So the current #1 goaltender in the ECHL gets a recall to the AHL. Sounds like a nice reward for a job well done, right? Or a “let’s see what you can do at the next level” story? In this case, a rookie backup gets sent down for the weekend to regain some confidence, plays three games in three days, and turns into a virtual brick wall. After a three game in three day stretch that saw him give up just four goals–not counting a shootout winner–goaltender Connor Ingram was recalled to Syracuse on Monday. All he did was go 2-0-0-1 with a 1.30 GAA and a .960 save percentage, which currently tops the ECHL among goalies that have played at least 3 games/180 minutes. Programming alert: tomorrow on my weekly visit to Raw Charge, I’ll have more on Ingram’s weekend, including GIFs! With Ingram returning to the Crunch, Nick Riopel’s one game stint as backup to Michael Leighton came to an end, and he will return to the Thunder net. Also recalled to Syracuse: defenseman Matthew Spencer, who also appeared in all 3 Thunder games this weekend as well, going scoreless and +1. He was paired for most of the weekend with former Crunch defenseman Mathieu Brodeur, incase anyone in Crunchland was wondering. One other trade I missed from Thursday: a few hours after the Crunch sent down Ingram and Spencer, the Thunder acquired forward Ben Murphy from Norfolk in exchange for defenseman Ryan Segalla. In 9 games for Norfolk this season, the Massachusetts native has one goal and one assist. He made his professional debut late in the 2015-16 season with Tulsa after finishing a four year collegiate career at Bowling Green State, where he was a teammate of current Thunder forward Pierre Luc Mercier. Last season, he appeared in 16 games for Tulsa and 49 games for Norfolk, with a combined 16 goals and 15 assists. Segalla appeared in 4 games for the Thunder, with 0 goals and 4 assists. Or should I really say, out west with the Thunder, with the road trip still happening. But anyway, I digress. -On Thursday, Syracuse sent down goaltender Connor Ingram and defenseman Matthew Spencer to the Thunder. 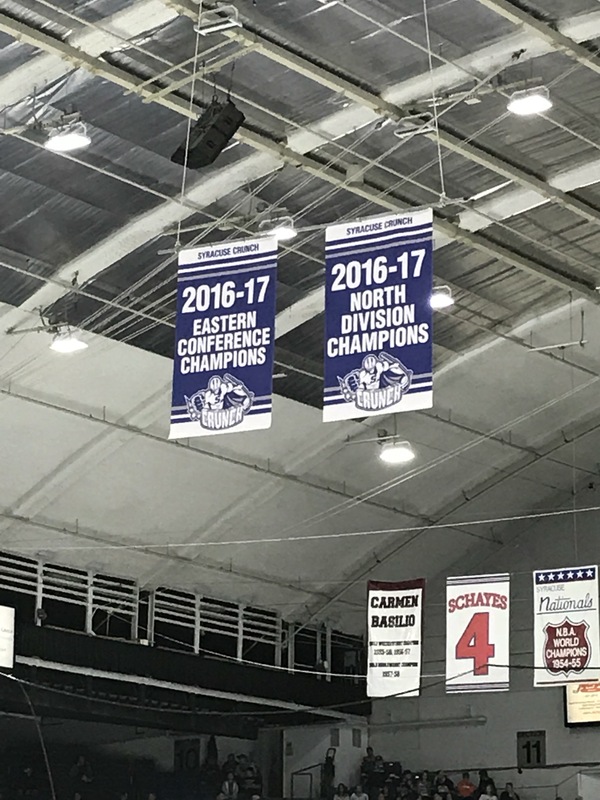 With the Crunch only playing four games in the next 8 days, while Adirondack has 6 games in the same timespan, the plan is for both players to get some extra game action in, much like Colton White did at the end of October with his three game appearance before returning to a regular spot in Binghamton’s lineup. Ingram has made six appearances for the Crunch thus far, going 1-3-1 with a 3.36 GAA and .860 save percentage. He last started on Saturday in Laval, taking a 5-2 loss against the Rocket. Spencer has appeared in just two games for Syracuse thus far, with no points and a -1 rating. He last played on October 28th in Rochester. To take Ingram’s spot, Nick Riopel was recalled to the Crunch and will back up Michael Leighton on Saturday at home against Charlotte. How long he stays up remains to be seen. -This may not be the only roster action we’ll see before the weekend is out. By Sunday at 3:00 PM, all 27 ECHL teams must lower their roster limit from 21 to 20 players. With a seemingly different Thunder lineup every week so far–27 different players, goaltenders included, have made at least one appearance, with 8 appearing in all 10 games thus far–this will be an interesting decision to see who ends up on the chopping block. Adirondack is in the middle of a busy week. The good news is reinforcements are on the way from both affiliates as a 3 in 3 weekend and a 12 game road swing looms. -First, on the Devils side, rookie defenseman Colton White was reassigned by Binghamton. The 20-year-old made his professional debut on Saturday in a 4-3 loss to Lehigh Valley, going scoreless and a -3. A 2015 4th round draft pick by New Jersey, White also was part of Albany’s taxi squad during the 2016 and 2017 playoff runs. -Second, on the Lightning/Crunch side, forward Shane Conacher was reassigned. The younger brother of Cory, this Conacher came to Syracuse via a tryout after performing well in Nashville in a preseason rookie tournament, and ended up with an AHL/ECHL deal. He appeared in 2 games for Syracuse going scoreless, but a numbers game is sending him north. The second year pro split last season between Orlando (25 games) and Toronto (3 games) after completing three years at Canisius College. With the additions of White and Conacher, the Thunder now have 14 forwards and 9 defensemen on the roster. After an outstanding opening night, Troy Bourke has missed the last three games, no information available as to why. After a loss to Greenville last night, the Thunder host Toledo for the first time ever for a pair of games Friday and Saturday, then it’s goodbye Glens Falls for the next 4 weeks, as the epic 12 game road swing begins Sunday afternoon. Shameless Plug: here’s my weekly Raw Charge column. I’m bringing my old Devil recap concept every Tuesday afternoon! This space will be for any news during the week, such as today for example. I’ll be back on the AHL beat next week with my first…sigh…Binghamton game in Utica. But I’ll have my weekly column on Inside AHL Hockey every Monday or Tuesday. I will be in Adirondack on Friday night, my lone game this week (work weekend, complete with a 6 AM shift on Sunday…so yeah not going far). -Binghamton released all four Thunder invites on Monday from their camp–defensemen Desmond Bergin and Tim Boyle, and forwards Pierre-Luc Mercier and Tim Harrison. Also, goaltender Ken Appleby was officially reassigned to Adirondack earlier this afternoon. 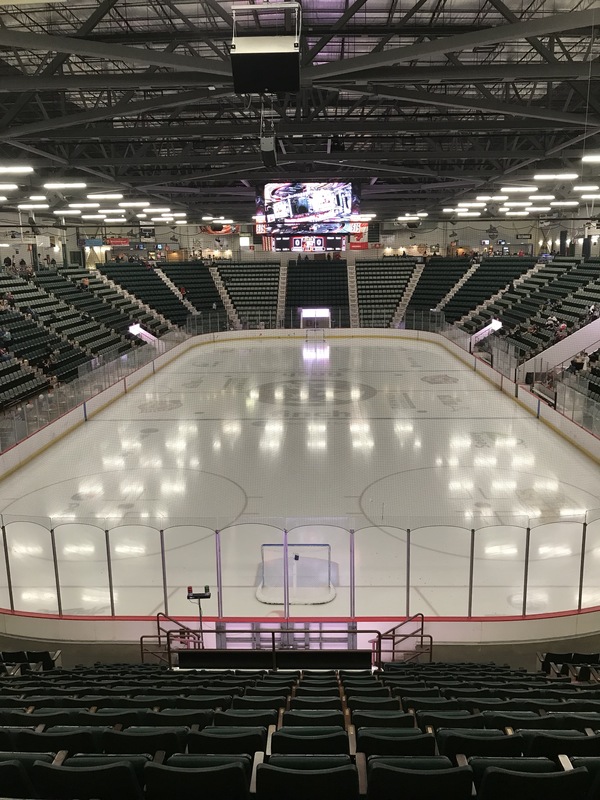 -Syracuse sent their second player to the Thunder, and it’s a familiar name around Glens Falls…forward Ty Loney returns for his second go around with Adirondack. He began last season with the Thunder, scoring 18 goals and assisting on 22 others in 36 games. He also had a 4 game stint with Albany, picking up one assist, then would spend a majority of the second half of the season with Chicago. In 20 games with the Wolves, he scored 4 goals and had 5 assists, earning an AHL contract in the process. He also had three points in 8 Calder Cup playoff games as Chicago got as far as the second round, before bowing out to eventual champion Grand Rapids in 5 games. -While players are coming down to Adirondack, one is already going up: defenseman Mathieu Brodeur has signed a professional tryout agreement with the Springfield Thunderbirds. The ECHL and Marvel have struck a deal that will bring to all 27 teams a Marvel Superhero Night this season. The promotions will feature specialty jerseys, merchandise, character appearances, and more. Adirondack’s designated Super Hero Night falls on their lone home appearance in November, Saturday the 25th, when they host Reading. Caleb Cameron: 24-year-old forward attending his first professional camp after four years at R.I.T. Jack Ceglarski: forward who made his pro debut with the Indy Fuel after finishing his senior year at SUNY Geneseo, appearing in 5 games and going scoreless. Evan Neugold: center who is entering his second pro season after splitting last season in the SPHL with Columbus and Knoxville. Mark Petaccio: second year pro forward who spent last season with four different teams after playing one year collegiately in Canada. The first official player assignment came Sunday, as goaltender Nic Riopel was reassigned by Tampa Bay to the Thunder. Riopel is under an AHL contract with Syracuse, and will be entering his second season as the official #3 goaltender on the Crunch depth chart. The 28-year-old is no stranger to Glens Falls–he started his pro career with the Adirondack Phantoms in the 2009-10 season, making 10 appearances in net and going 4-6-0 with a 3.35 GAA and .893 save percentage. The former Flyer 5th rounder would appear in 11 games for the Phantoms in 2010-11, but spent a majority of the season in ECHL Greenville. After spending two seasons overseas, he returned to North America with Norfolk and Rapid City in 2015-16 before spending all of last season with Kalamazoo. In 32 games for the Wings Riopel went 18-12-1 with a 3.13 GAA and .899 save percentage. Four Thunder players–Tim Boyle, Pierre-Luc Mercier, Desmond Bergin, and Tim Harrison–are currently in Binghamton’s training camp. Terrence Wallin was briefly at Crunch camp, but was released before Syracuse began their preseason slate. -Over the weekend, a two part series on the Thunder forwards and defensemen. Just 15 days after he was honored by having the Cool Insuring Arena press box named for him, Dave Strader lost his battle with cancer earlier today. A native of Glens Falls, Strader was the original voice of the Adirondack Red Wings in the late 1970s/early 1980s, then later would announce games for several NHL teams before joining NBC. He was most recently the voice of the Dallas Stars before his diagnosis.